Montana cowgirl Faith Stevenson likes to train stuff – trick horses, show cattle, and even her voice. In addition to having a futurity ranch colt in the Northern International Livestock Expo, Stevenson, of Hobson, Montana, will sing the national anthem to open the pro rodeo Oct. 15. It's just her idea of giving back to a nation that has made her dreams possible. "It's a good way for me to use my talent to honor our country," says Stevenson, 18. "We are lucky and blessed to be able to live the way we do, and we only do because of the sacrifices other people have made." Stevenson says the Star Spangled Banner celebrates her Montana way of life. She is the daughter of Clint and Adana Stevenson who raise registered Angus on the Diamond Dot Ranch. "The work ethic and a love for this country are what our ranchers have in common with the armed forces," Stevenson says. By the dawn's early light, she can be found choring at the Diamond Dot. Twilight's last gleaming will likely find her doing more of the same, or working with a horse. Stevenson leaves Montana in May to study under internationally acclaimed horse clinician Clinton Anderson. She hopes to be one of four students that he certifies. She can't remember a time when she didn't ride. At the age of 8, Stevenson was already working with a well-known Montana instructor to learn how to show horses. She was also singing the national anthem for annual bull sales at the ranch. This year, she has distinguished herself as both a singer and as a horseman. 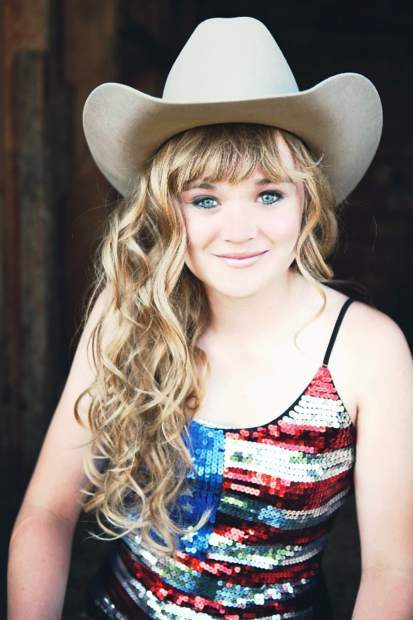 She took voice lessons by Skype and is first place vocalist for the Montana State FFA talent contest. Showing with the American Quarter Horse Association, she was eligible for both the novice championships and youth world's. Stevenson trained the trick horses that she uses for entertainment at bull sales, and started her first horse under saddle at 11. It all comes back to using horses for a living. Stevenson says the family cattle operation would not be able to function without them. The corrals hold half a dozen dependable ranch mounts at any given time. "We uses horses to move all of our cattle on the ranch," she says. "We find it is still the most fun and the easiest way to get the job done." The family runs heifers in the mountains and brings them home to calve for winter. "The country they are in, you can't get there with a four-wheeler." Stevenson earns money training, selling, and giving riding instruction as well as her work on the ranch. "I understand the value of hard work and managing my time to get it all done," she says. "I have a good understanding of the livestock industry and horses in general. Am I gifted? My biggest strength has been that I am a good teacher and a good communicator." If everything goes according to plan, Stevenson will soon be a certified Clinton Anderson clinician, and that, for her, would be something to sing about. Says Stevenson: "My true path in life is training horses."